This is Page 1 of 5 - the best of July 2011! 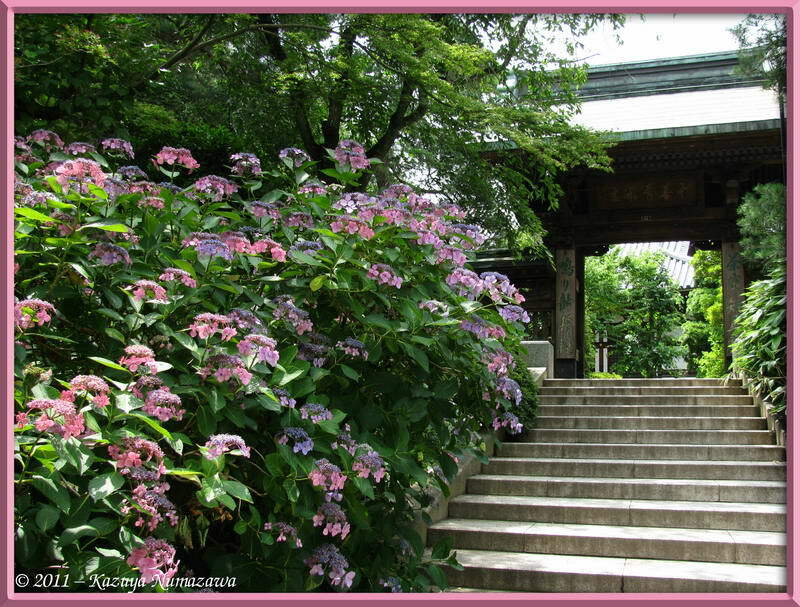 This page begins with July 1st, a trip to Takahata-fudo Temple to view the Hydrangea Blossoms. 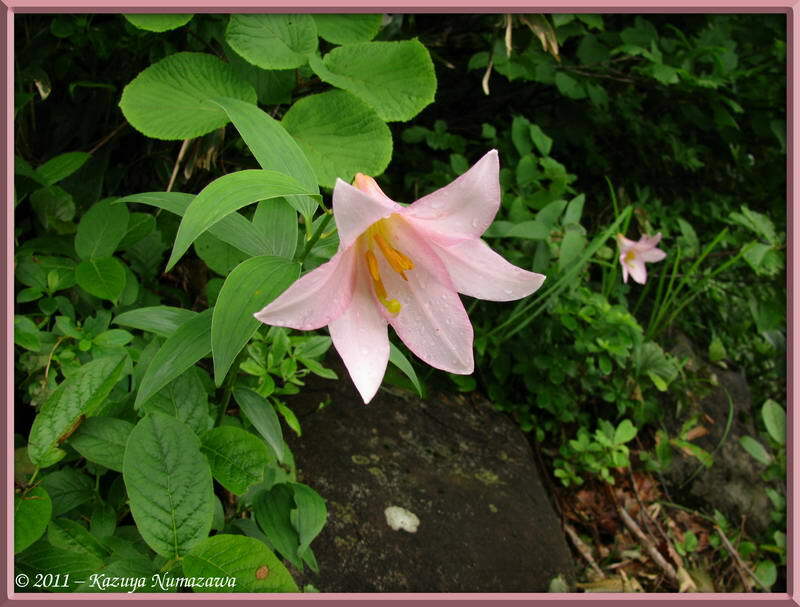 Then on July 3rd we'll go to Mitake and Mt. 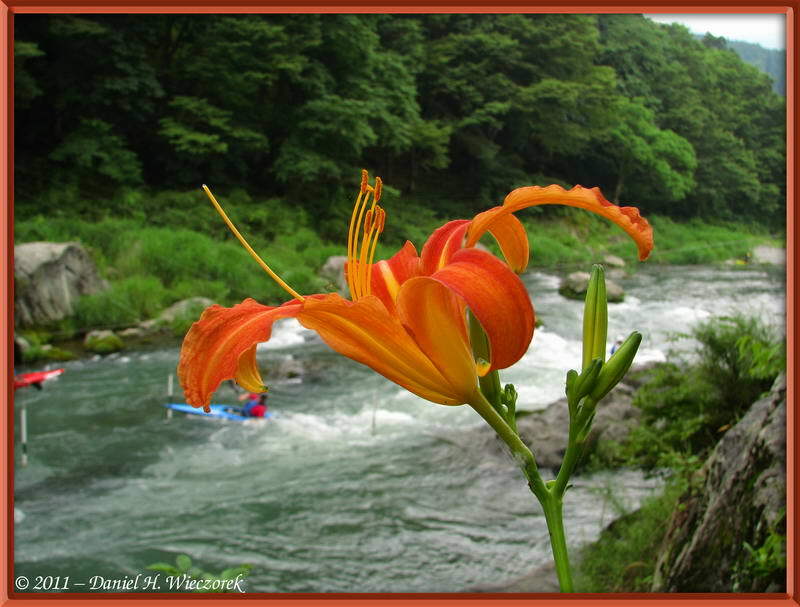 Mitake for a day trip. 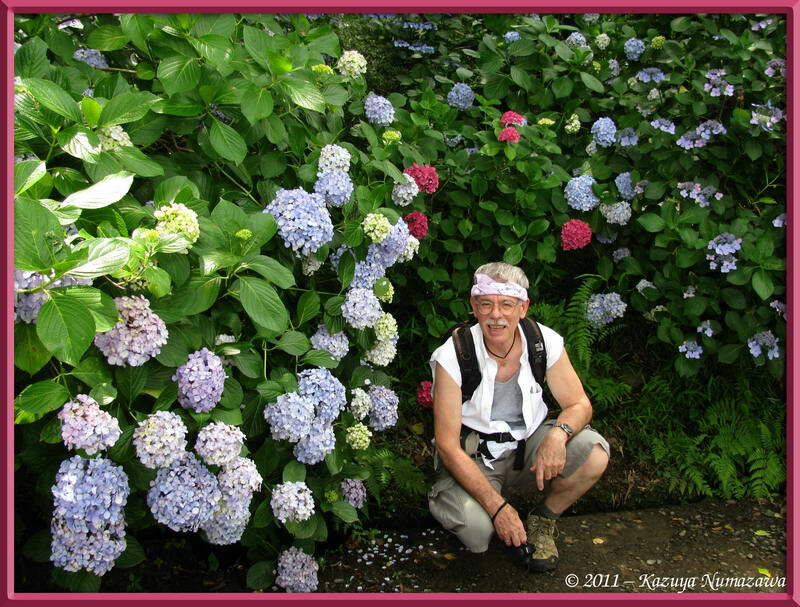 The next - and final day on this page - is July 8th and a trip to Niigata Prefecture and climb of Mt. 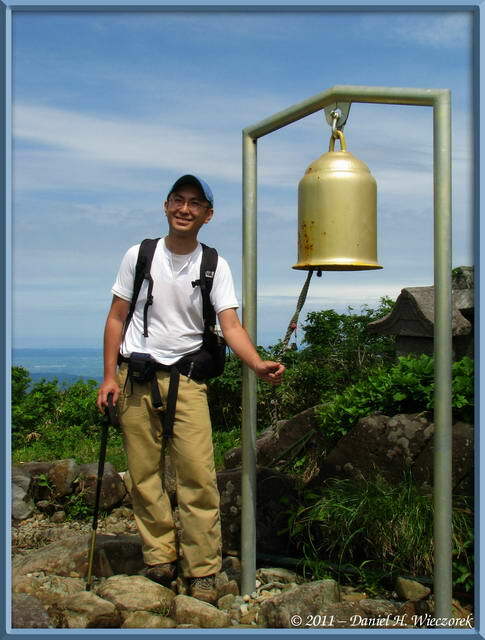 Ohtake (1,432 m = 4,699 ft) - the first summit of Mt. Sumondake. Click on any thumbnail to begin. 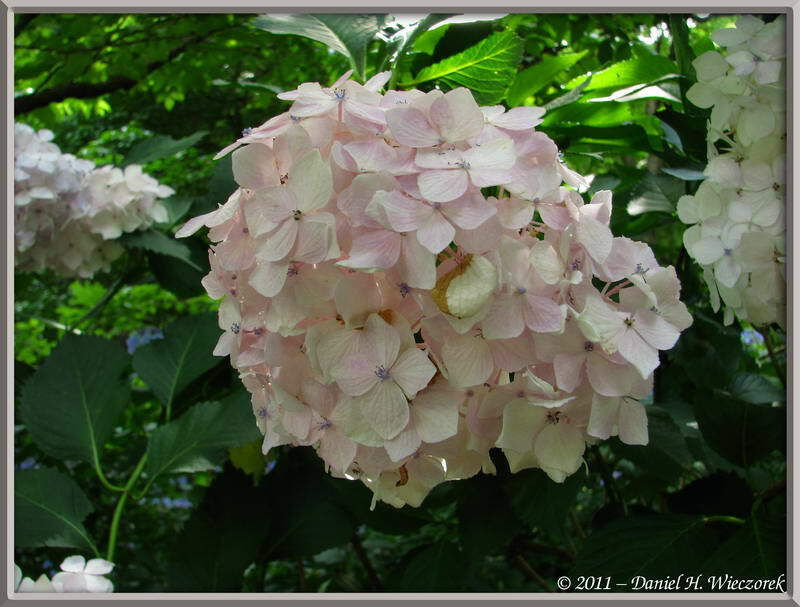 On Friday, July 1st, we took a trip to Takahata-fudo to see how the Hydrangea Blossoms were doing. 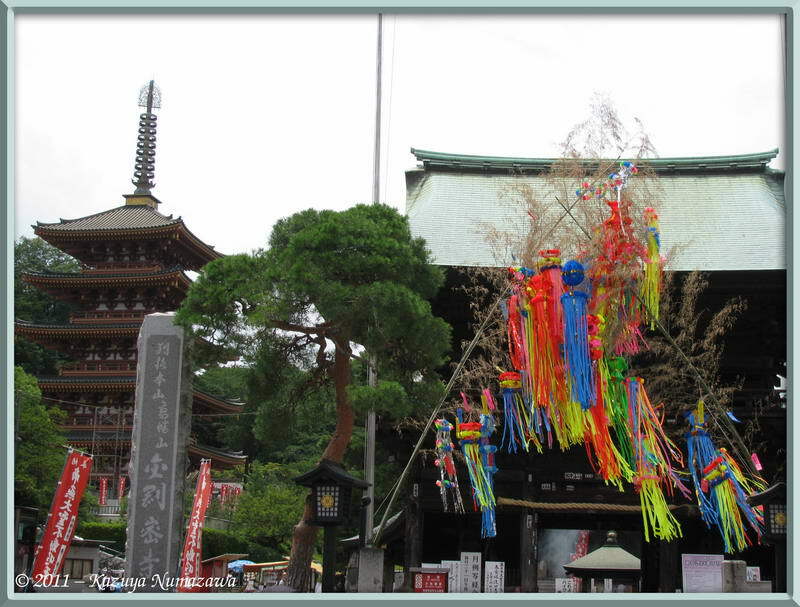 We last visited there on June 19, 2009, so we were a bit later this year. 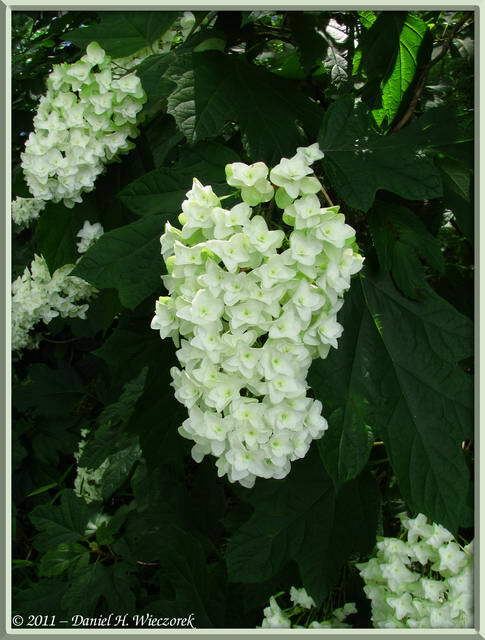 The blossoms were much better when we visited in 2009 - if you want to compare June 19, 2009 with July 1, 2011, please CLICK HERE to see what it was like in 2009. 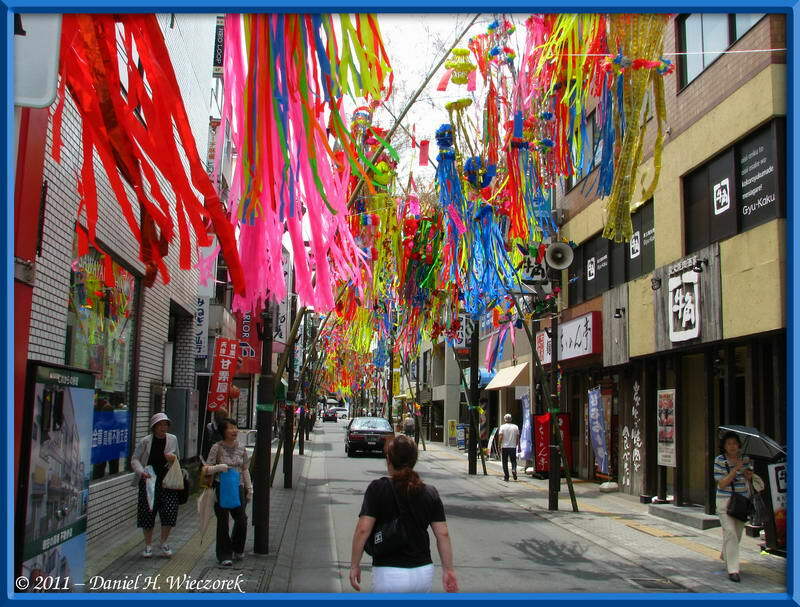 This time we were also close to the Tanabata Festival - I'm not going to go into detail about what Tanabata is, if you're interested you can Google it, but these colorful ribbons on the streets are for Tanabata. 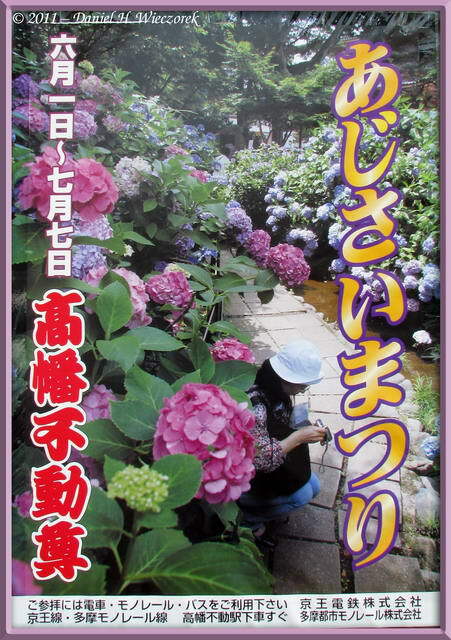 The 2nd shot shows the poster they made for the Hydrangea Festival. 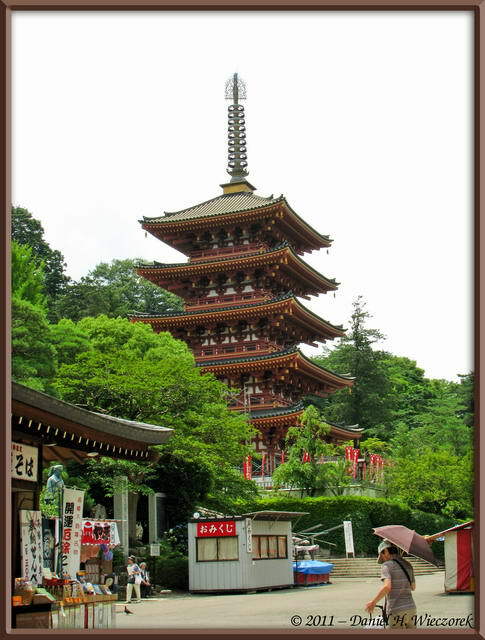 The 3rd shot shows the 7 story Takahata-fudo Pagoda off on the left. 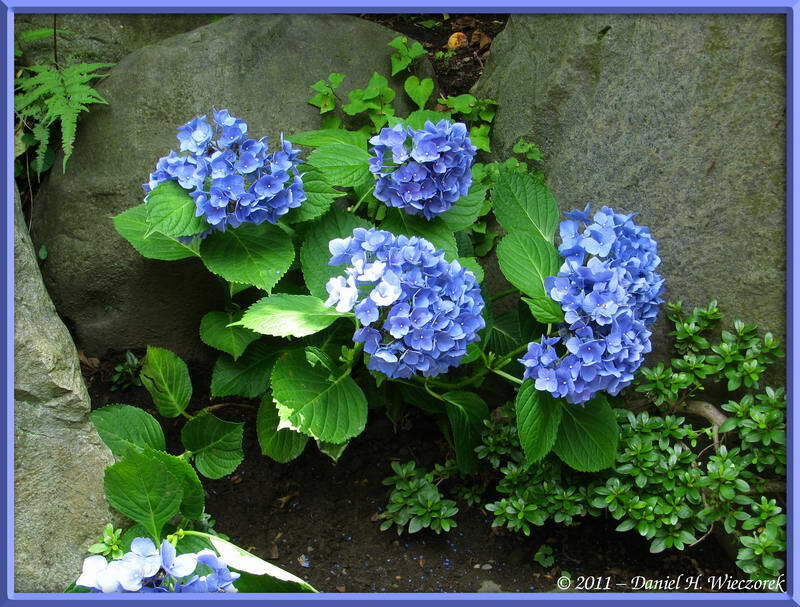 Here is a beautiful blue Hydrangea Blossom, followed by a photo of the Takahata-fudo Pagoda. 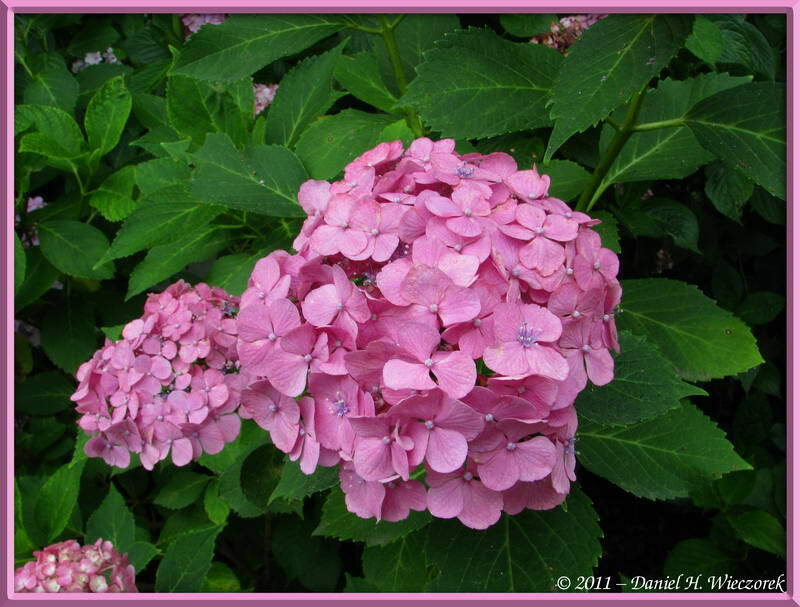 The 3rd photo shows more Hydrangea flowers - these are pink ones. 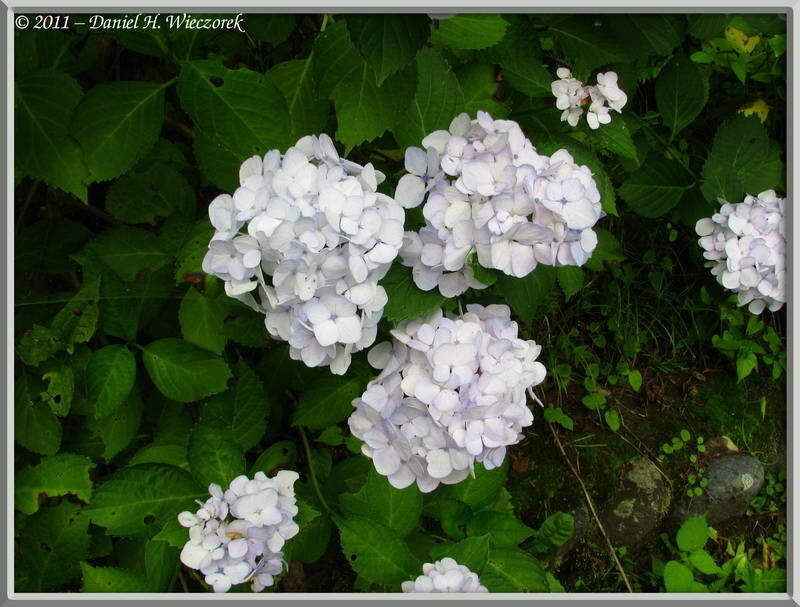 Here are 3 more shots of Hydrangea Flowers around the temple. The first shot here is nearly white in color. 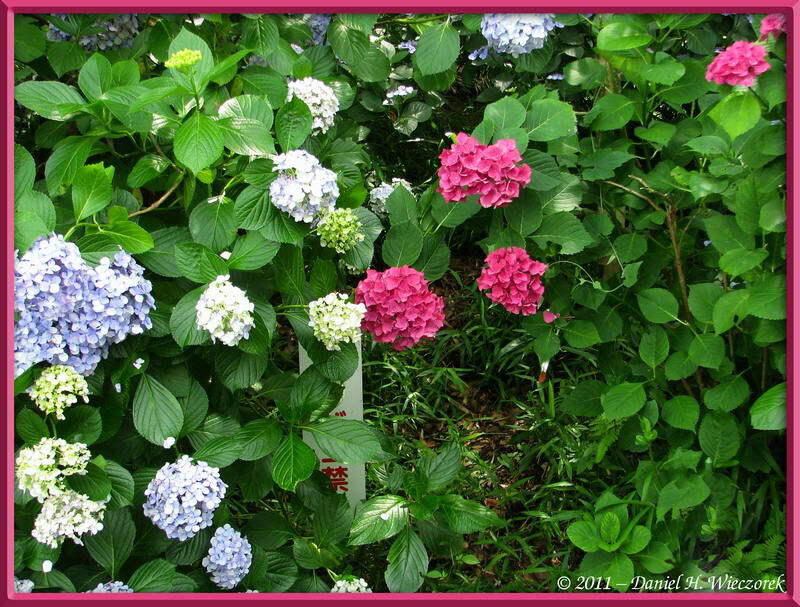 The 2nd is a reddish blossom and the 3rd photo shows a mixture of colors. 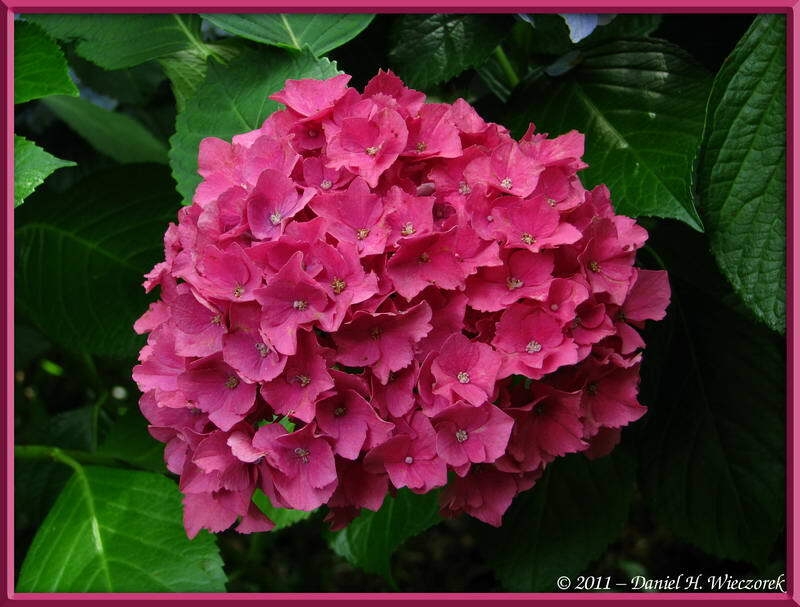 Here is a brilliant red colored flower followed by me crouched down beside some Hydrangea Bushes - for scale. 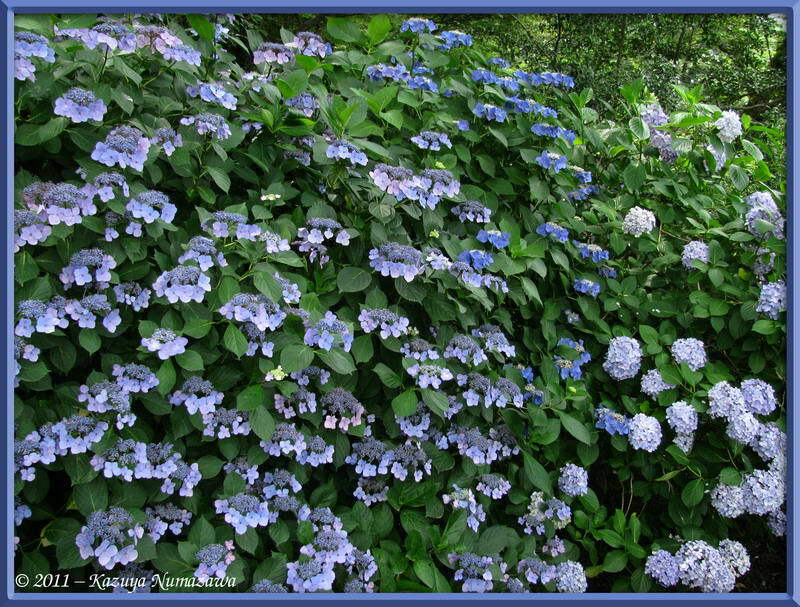 In the first photo here you can easily distinguish between 2 types of blue flowered bushes. 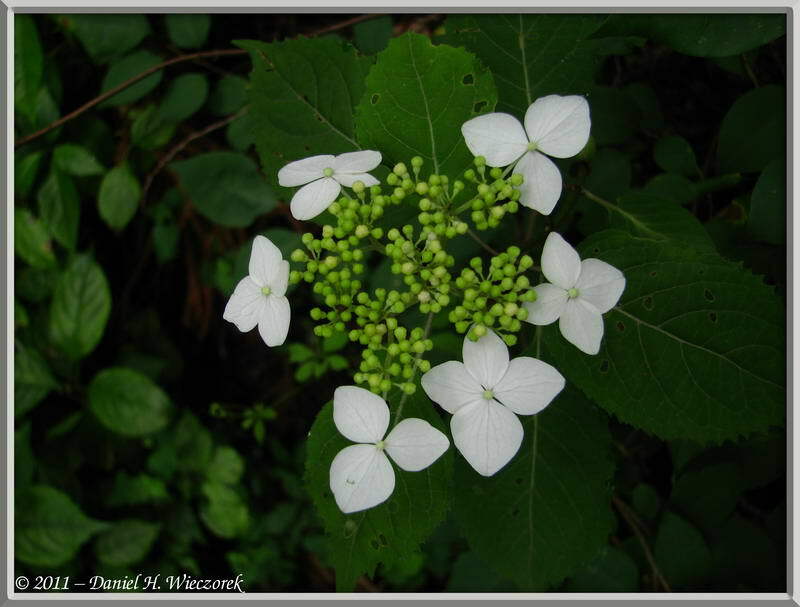 The 2nd shot is a white flowered one. 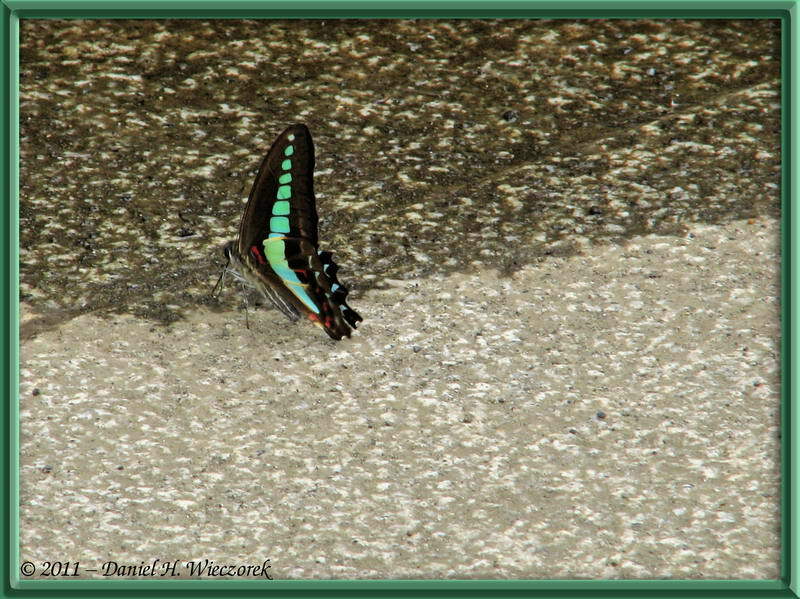 The 3rd shot is an incredibly colored butterfly. 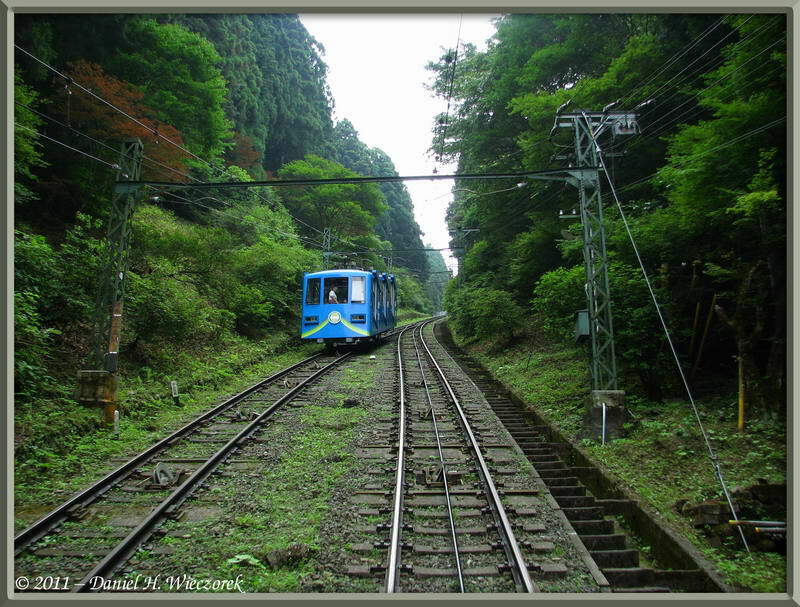 On July 3rd we went out to Mitake on the earliest Okutama Holiday Special Train from Mitaka (7:58 AM at Mitaka - arriving at Mitake about 1 hour later). We took the bus to the bottom of the cable-car and then took the cable-car to the top. From there we walked around for an hour or two and then ate our lunch, which we brought with us. Next, we hiked back to the top of the cable car and went down. Then we hiked down to the Tama River, bought some beer at a convenience store and drank beer and ate potato chips with our feet soaking in the cold and clear Tama River. 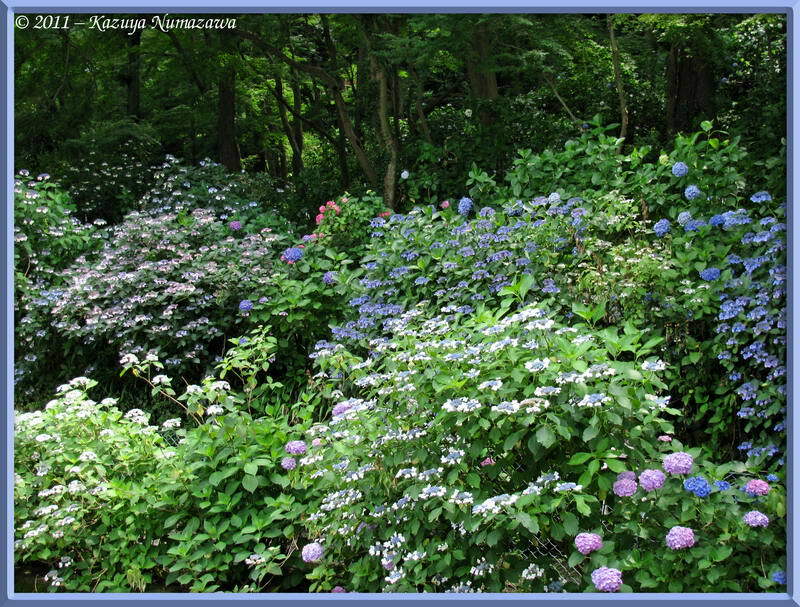 The 1st shot in this row shows a Yama-Ajisai (Mountain Hydrangea). 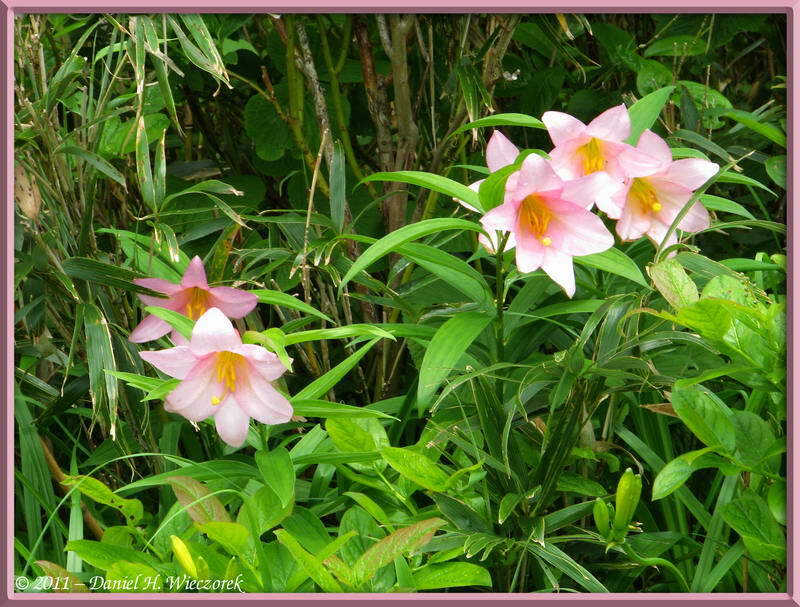 The 2nd shot is an unknown flower - I should know it, but it has been forgotten and I don't want to spend the time to look it up. 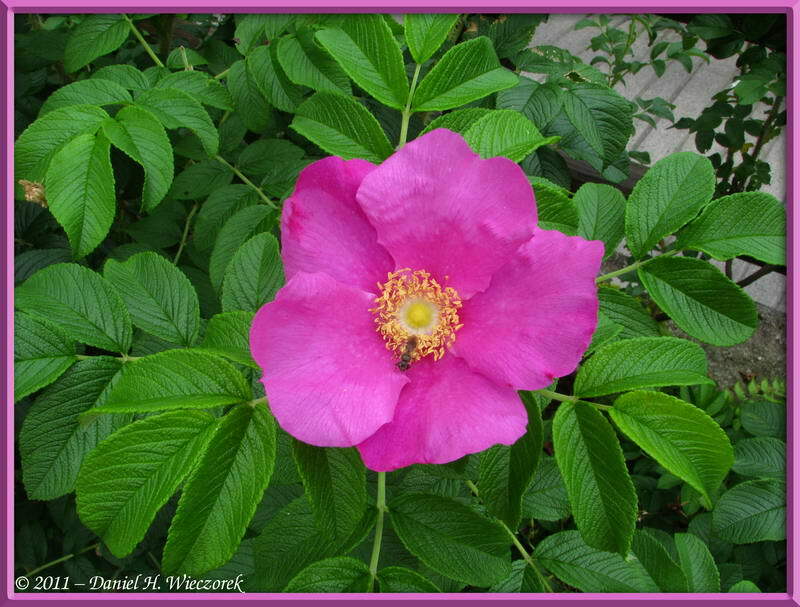 The 3rd shot is a beautiful wild rose - a Rosa rugosa. 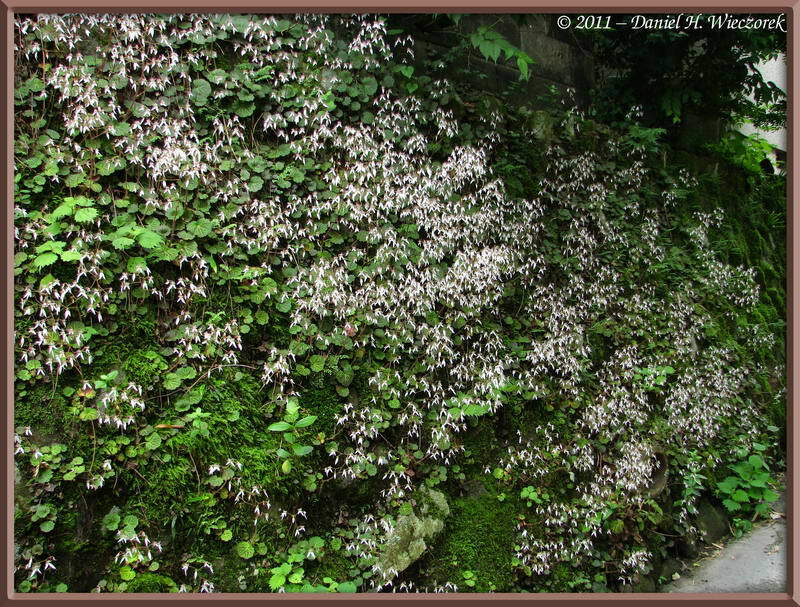 Here are 3 shots of Saxifraga stolonifera, which you can find a nice description of in our book "Outdoor Photography of Japan: Through the Seasons", which is available through this website, through Amazon.com or through your local bookstore - just get the ISBN from Amazon.com and order it at your local bookstore. 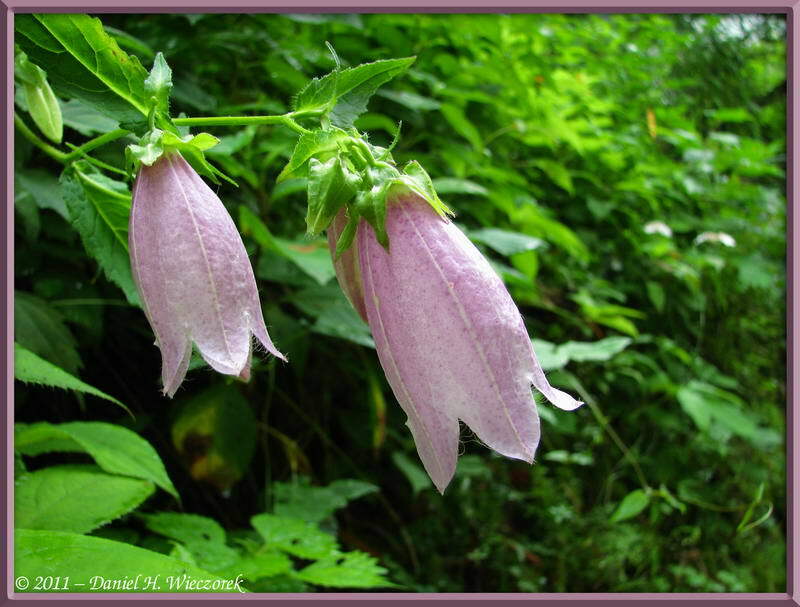 In 1st position in this row is a Campanula punctata. 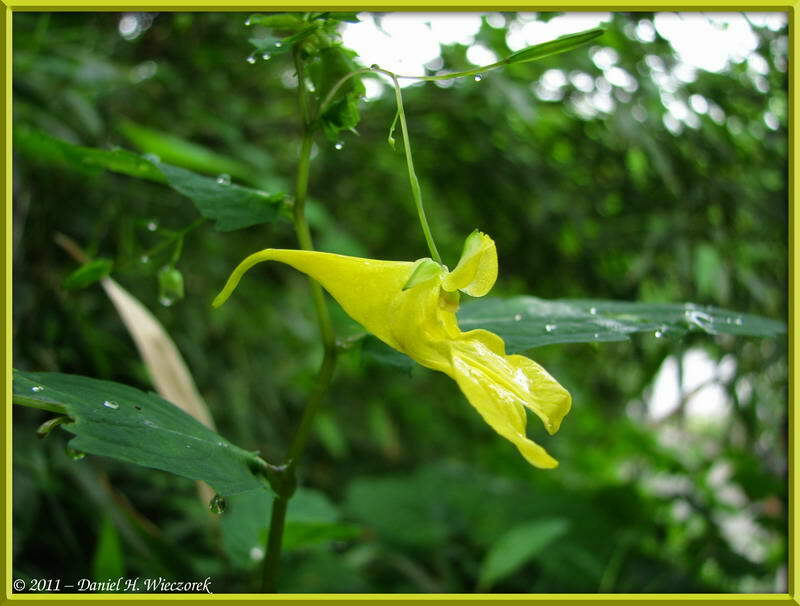 In 2nd and 3rd positions are shots of a yellow flowered Impatiens noli-tangere. 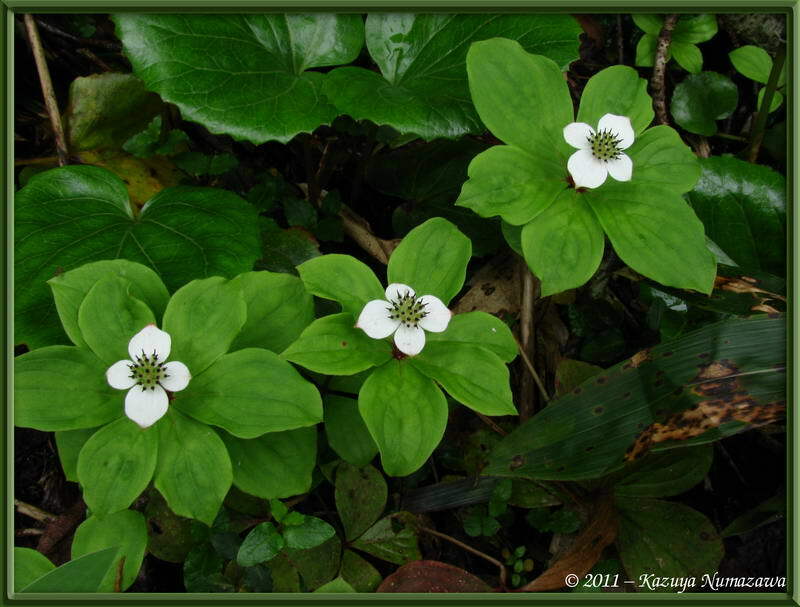 Here are 2 shots as we descended Mt. 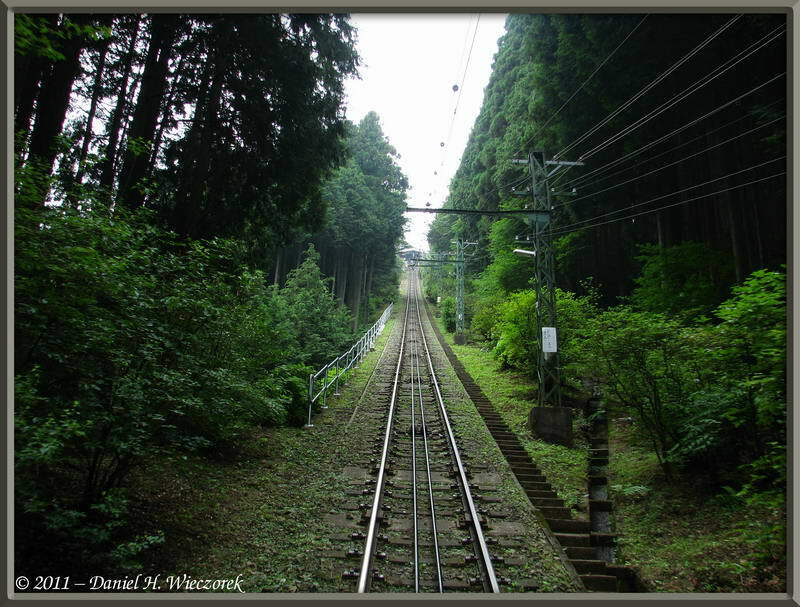 Mitake via the cable-car. We had never ridden in the back seat before, these shots are looking back up from where we came. 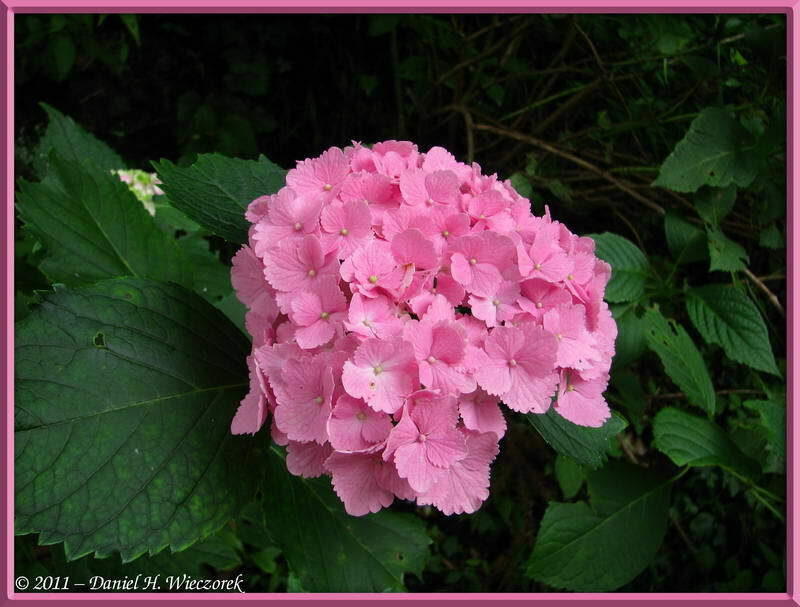 In 3rd position is a pink Hydrangea flower which we found as we walked downstream along the Tama River after we got off the cable-car and then hiked to the river. 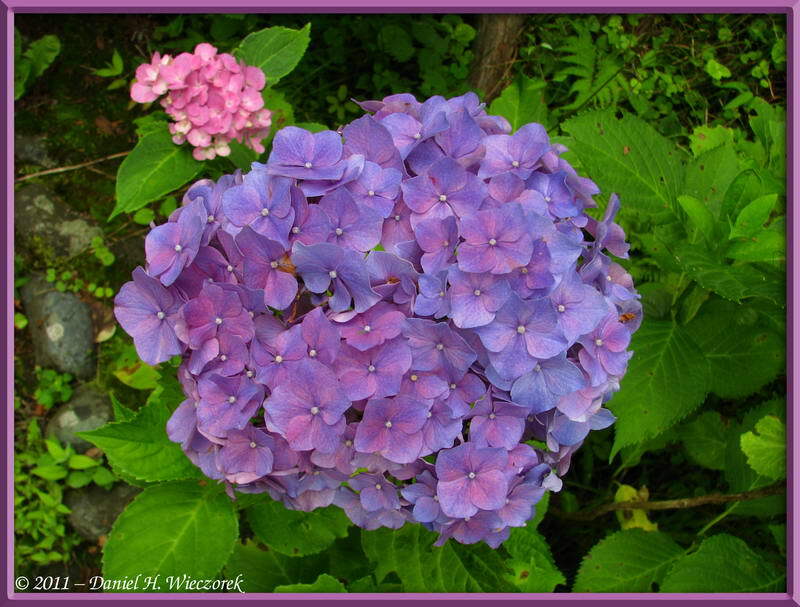 Here are 3 more shots of Hydrangea flowers. 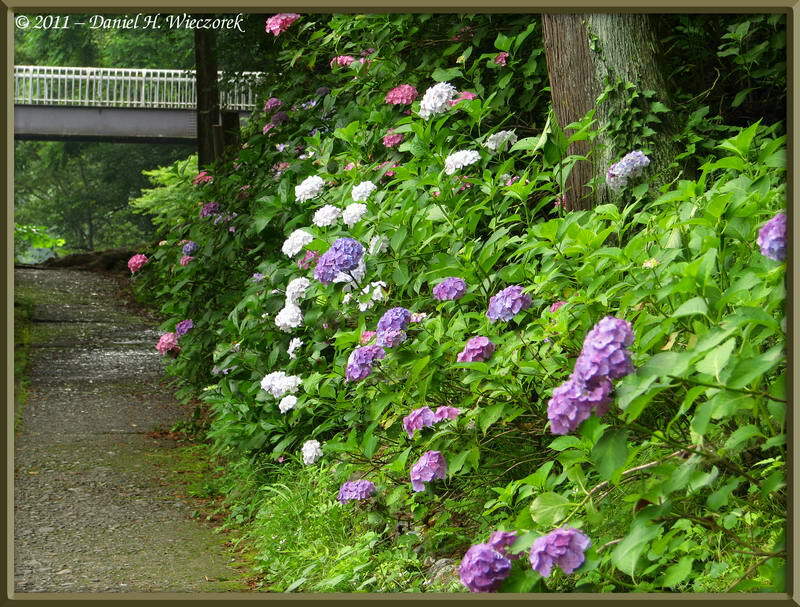 We were never really aware that Hydrangeas could be found along this section of river. 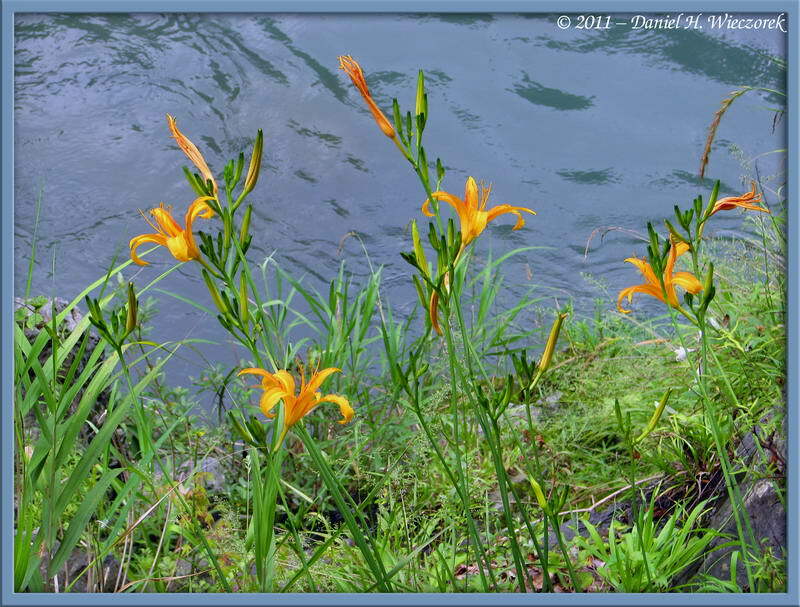 Here are 3 shots of day lilies which were growing along the river. 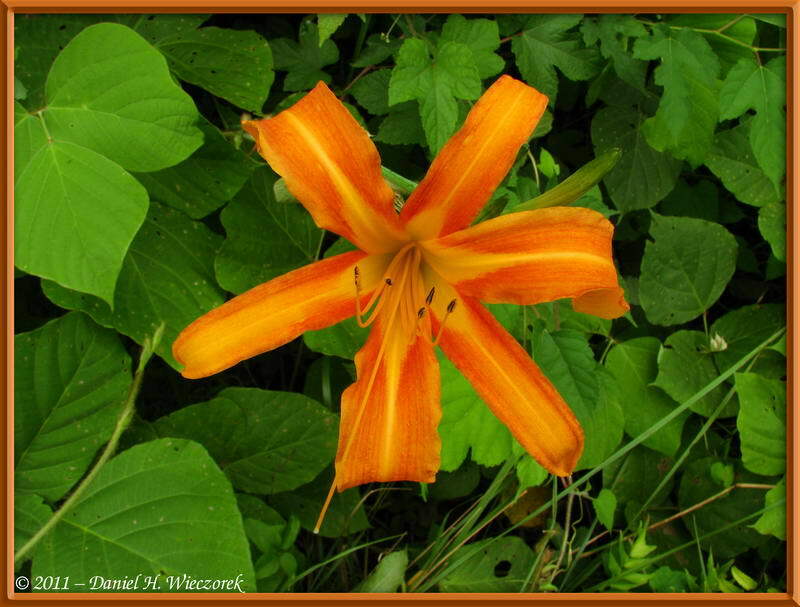 Kazuya identified this as Hemerocallis fulva var. longituba. In the 2nd and 3rd shots you can see the beautiful river. 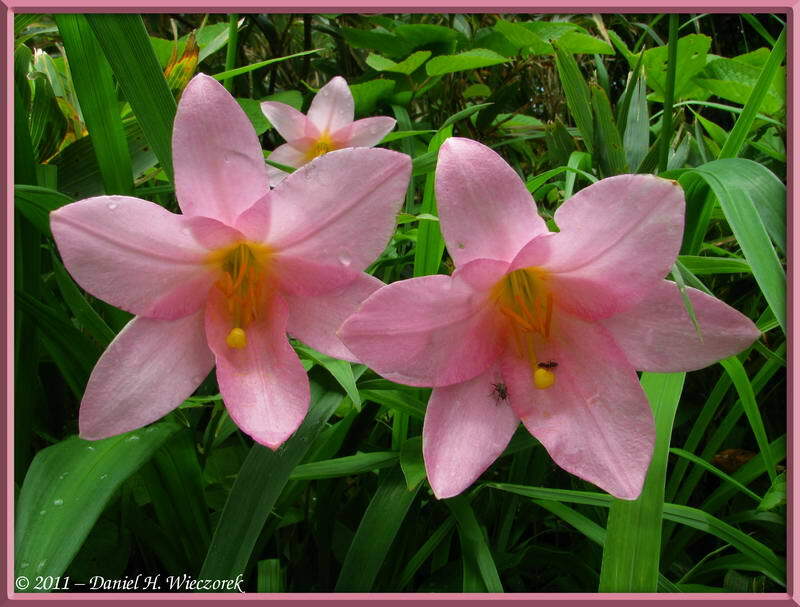 Our next outing was on the weekend of July 8th. We took a night bus to Nagaoka, in Niigata Prefecture and then a train to Koide. 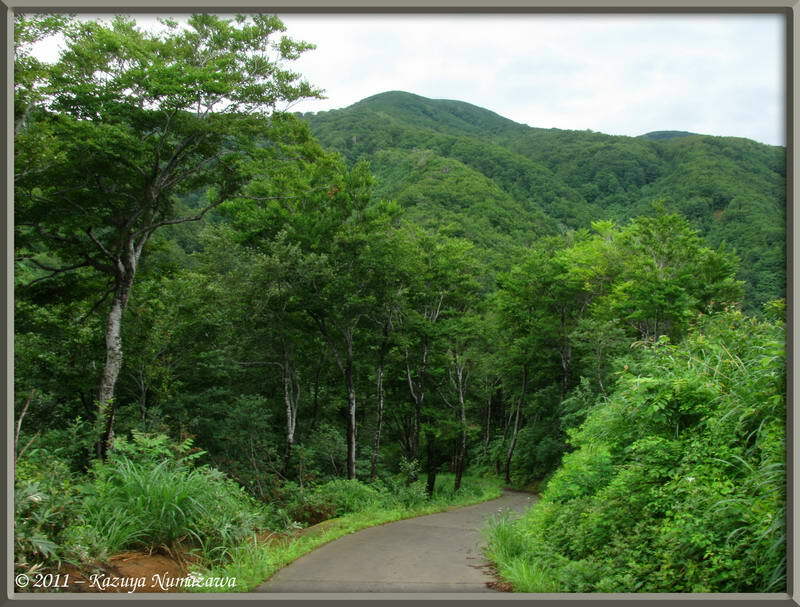 In Koide the owner of the Inn where we would be staying tonight picked us up and gave us a ride to the trail head to climb Mt. Sumondake. Mt. 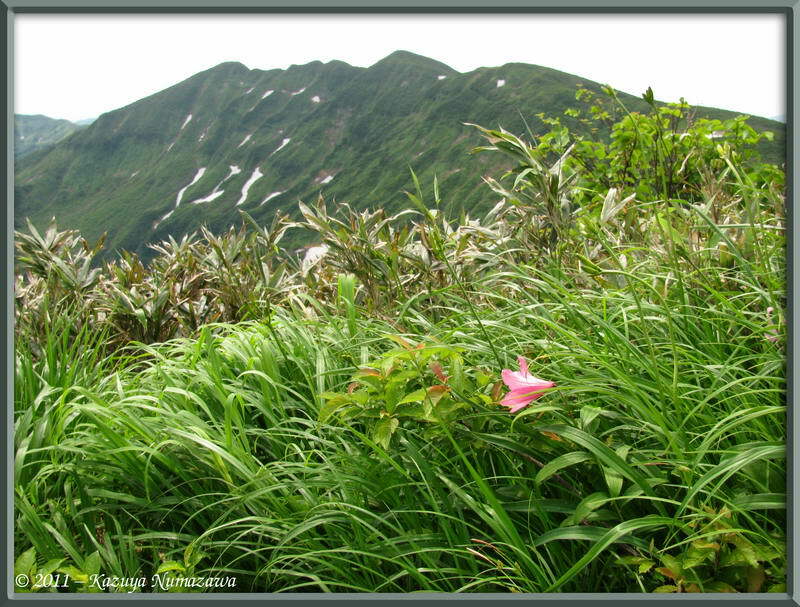 Sumondake is made up of 3 peaks - Mt. 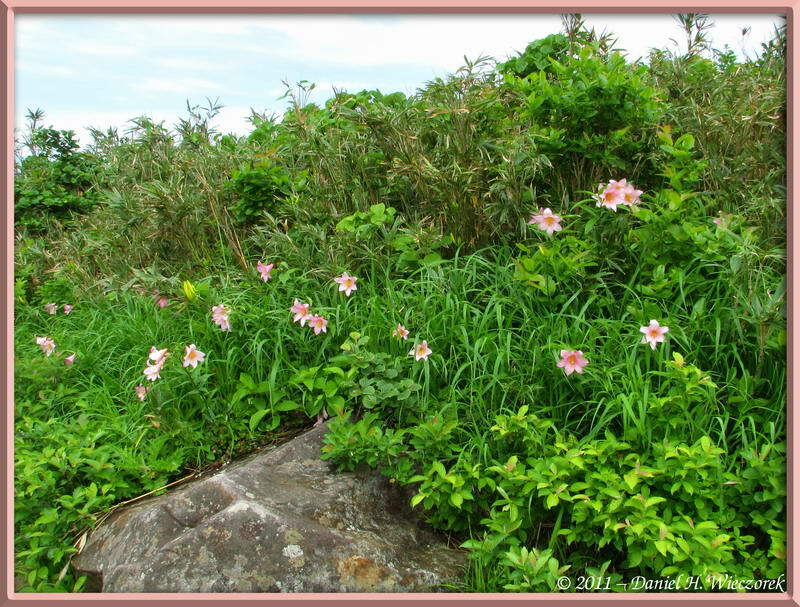 Ohtake (1,432.4 m = 4,699 ft), Mt. 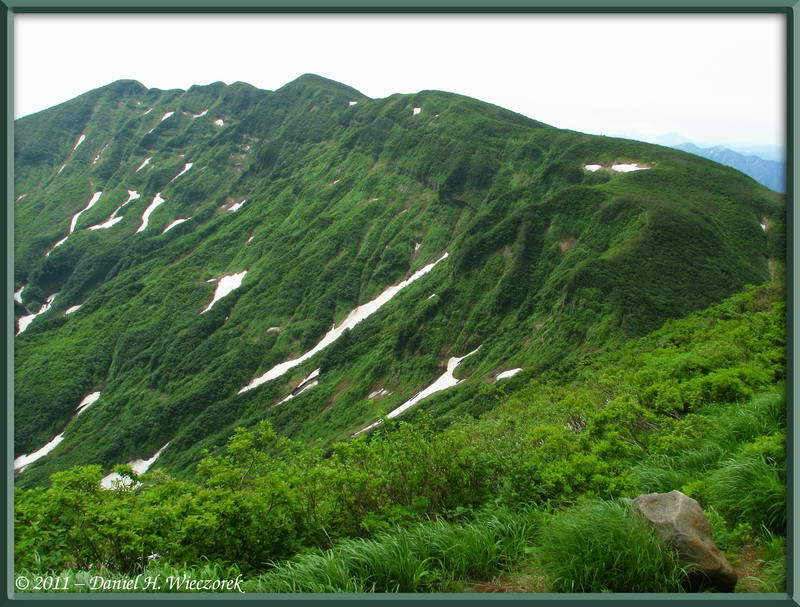 Aokumodake (1,487 m = 4,879 ft) and Mt. Hakamadake (1,537.2 m = 5,043 ft). 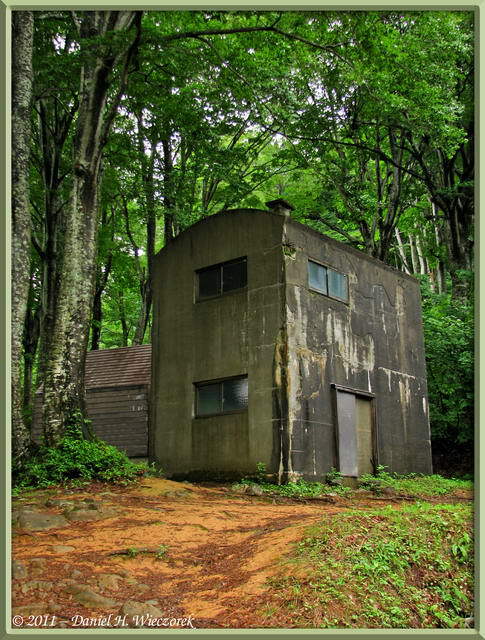 The first shot here is an abandoned Mountain Hut at the start of the trail. The 2nd shot is looking the opposite direction. 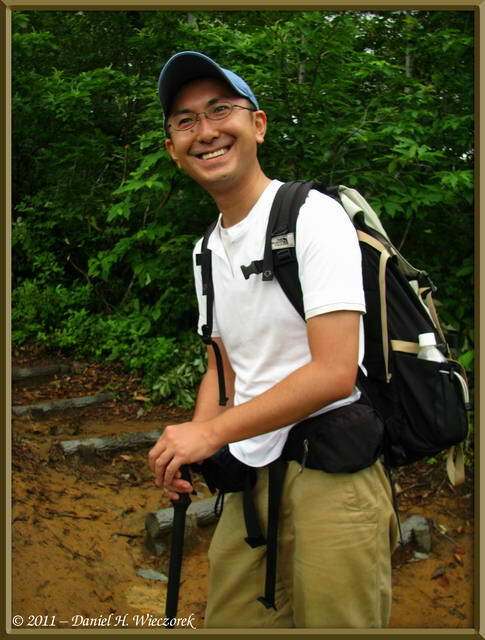 The 3rd shot is Kazuya, just as we started. 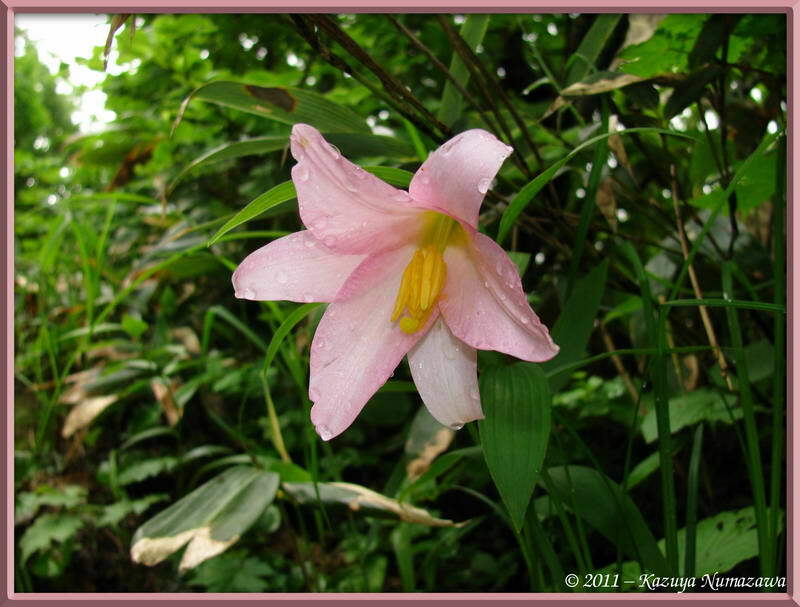 It had rained during the night, so the trail was wet and somewhat slippery, but at least it had stopped raining. The first shot here is a scenic shot. 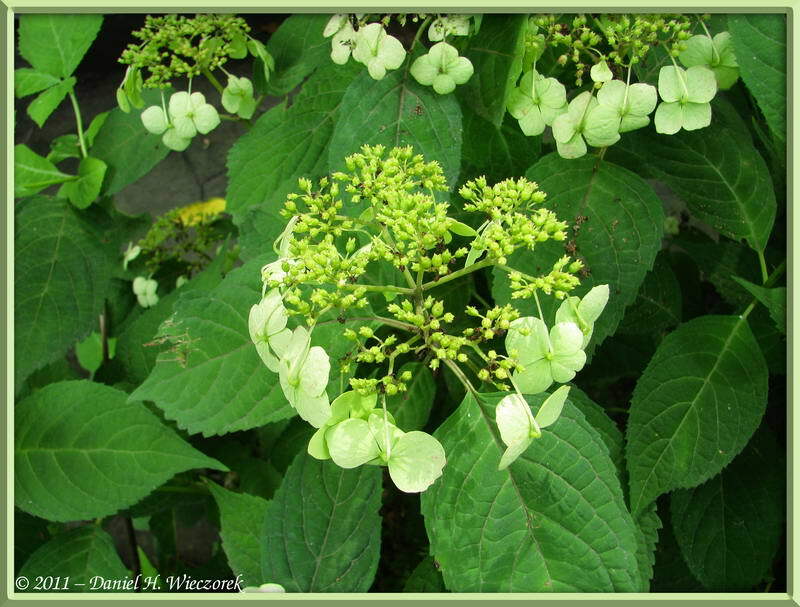 The 2nd shot is a Chamaepericlymenum canadense - a Canada Dogwood. 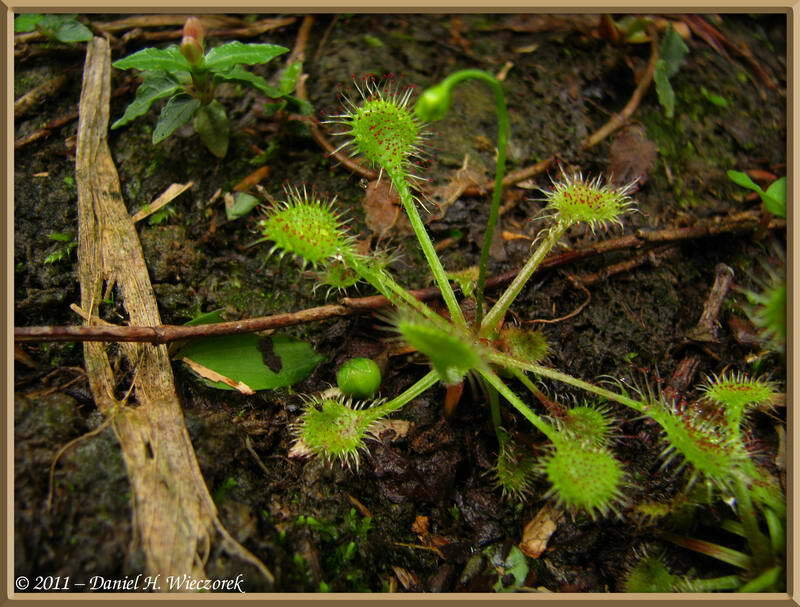 The 3rd shot is a Drosera rotundifolia - a sundew plant. 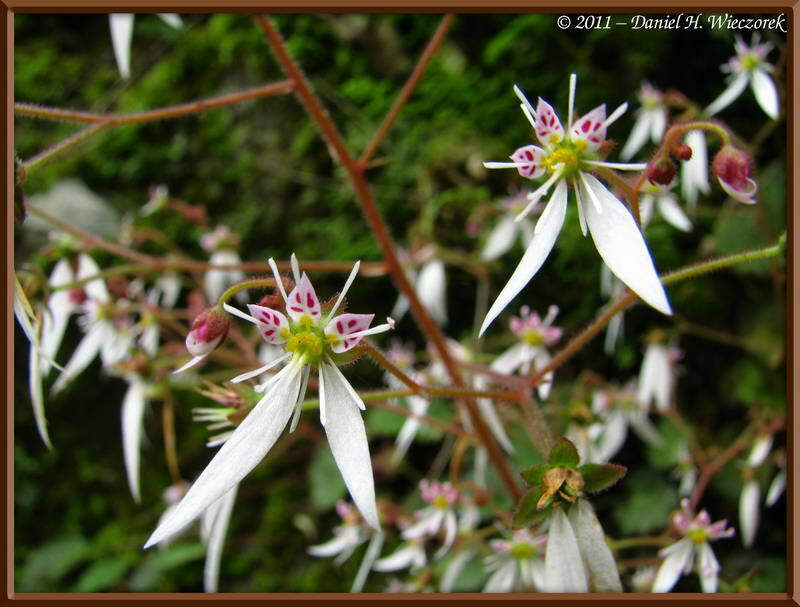 In case you don't know it, this is an insectivorous plant. 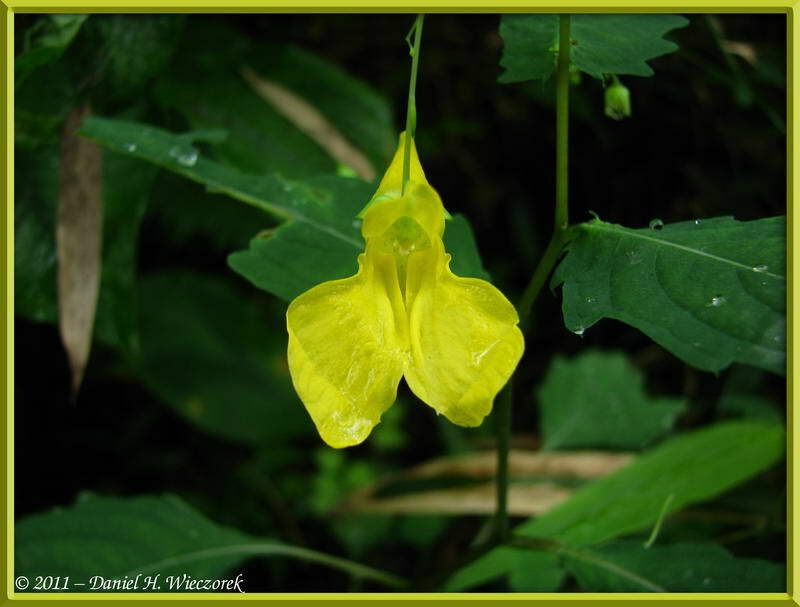 It is usually found in wetter locations than this area seemed to be. It was surprising to find it here. 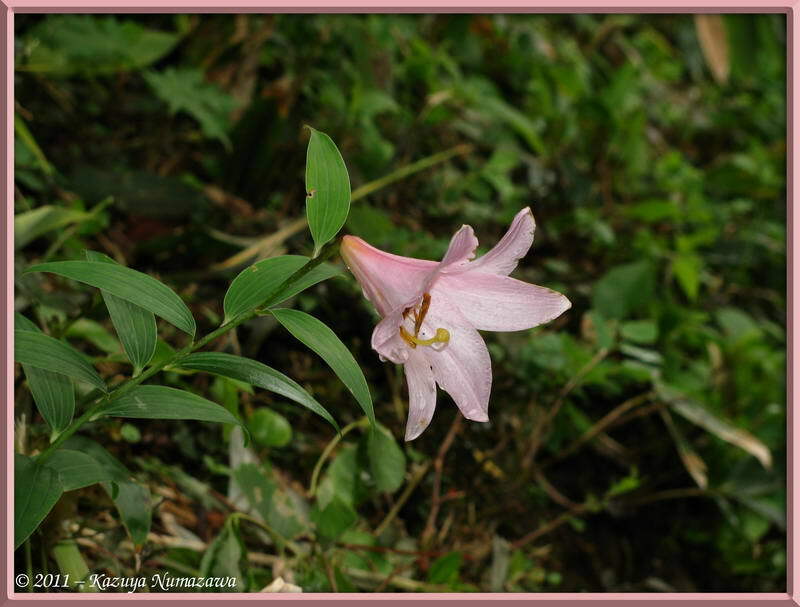 Here is the flower which we came here hoping to find - a Lilium rubellum - a delicately colored pink lily. 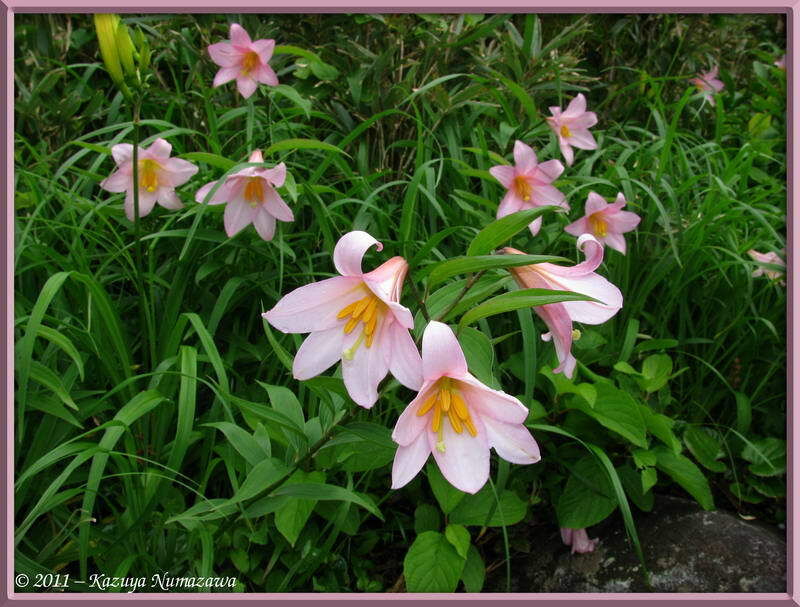 This lily only grows in a limited area of Niigata, Fukushima and Yamagata Prefectures. Of course we had never seen it before. 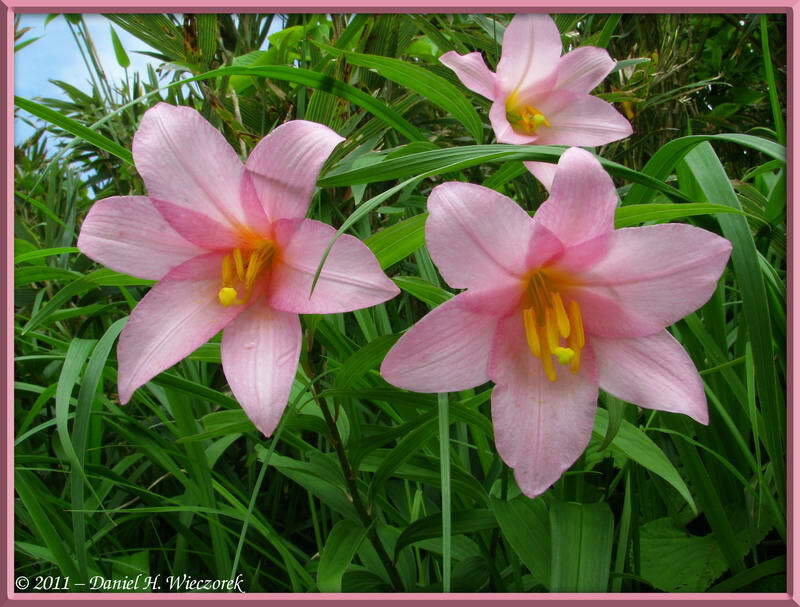 So, please expect to see a lot of this flower on the remainder of this page and a few more on the next page. 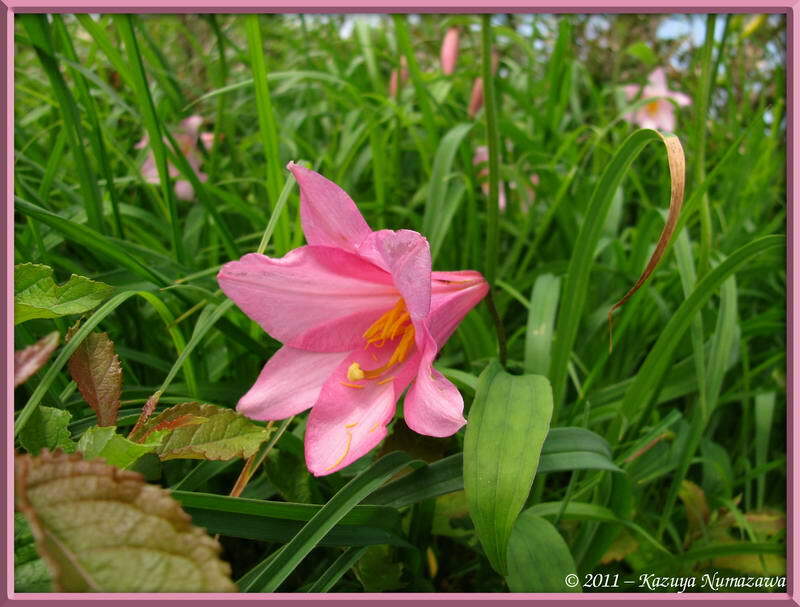 The 2nd shot is another scenic shot and, of course, the 3rd shot is another pink lily. 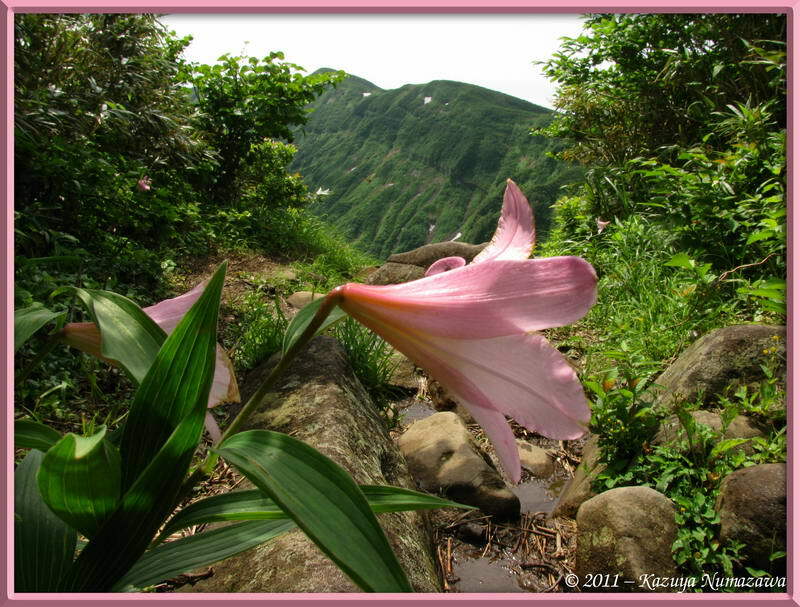 Here is one shot of Lilium rubellum followed by shots of Kazuya and then of me at the summit of Mt. 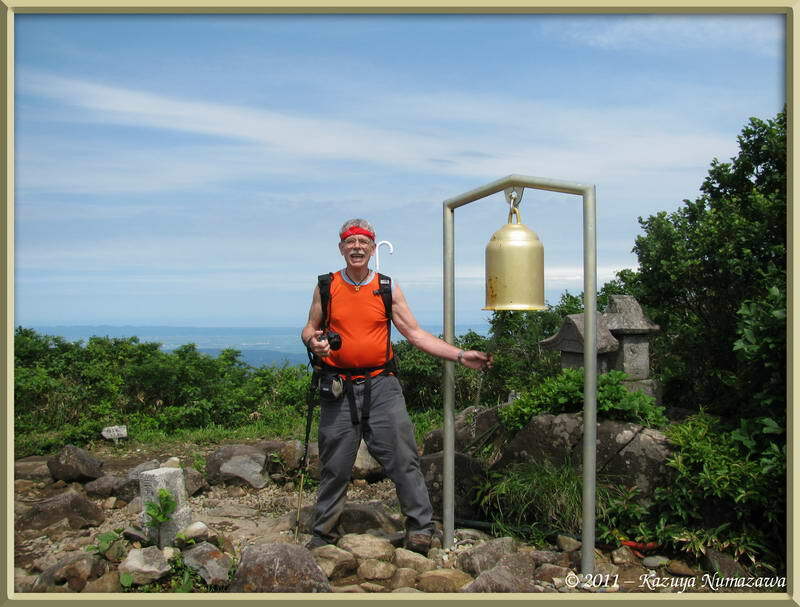 Ohtake (1,432.4 m = 4,699 ft) - the first summit. The bear bell had a very nice sound. Here is a scenic shot in first position. 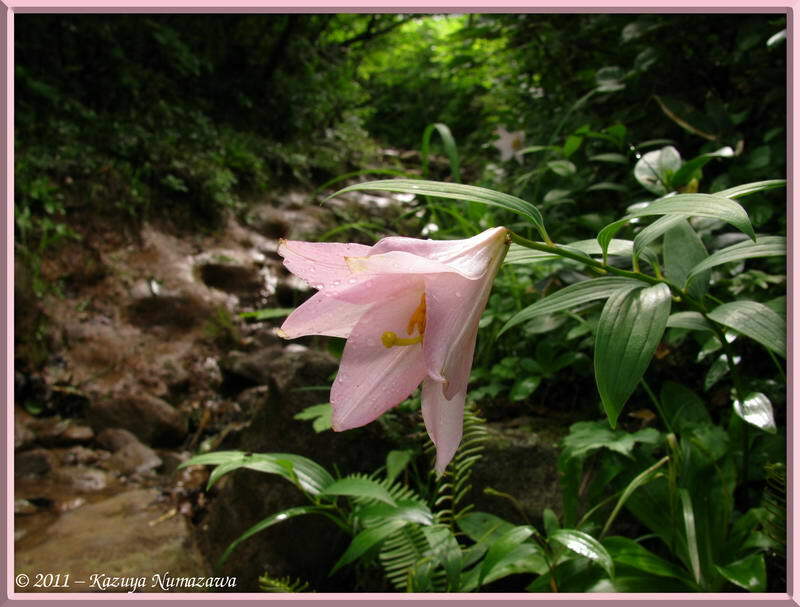 The 2nd shot is a Lilium rubellum with Mt. 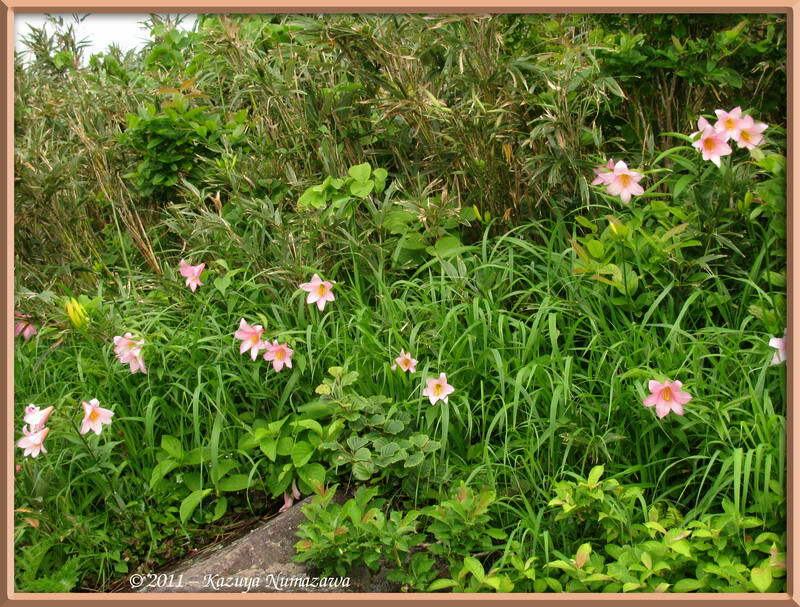 Sumondake in the background. The 3rd shot shows you the Mt. 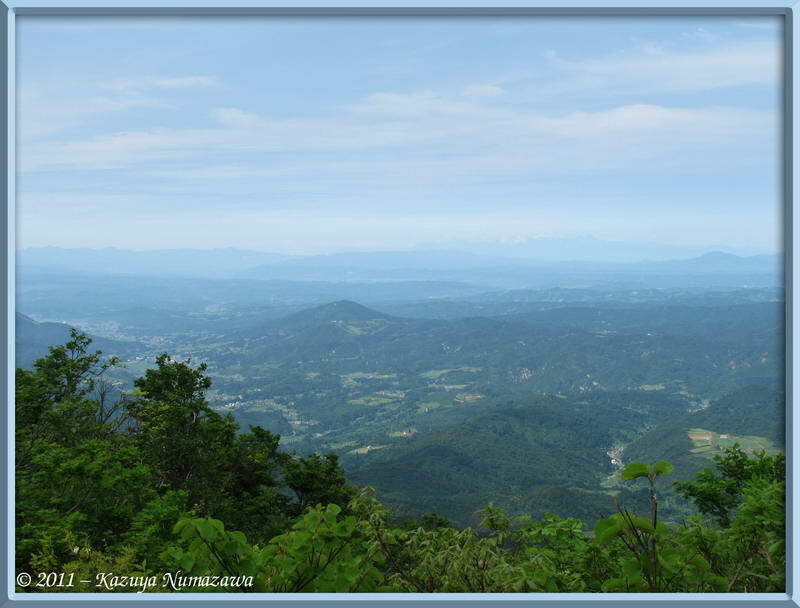 Aokumodake (1,487 m = 4,879 ft) and Mt. 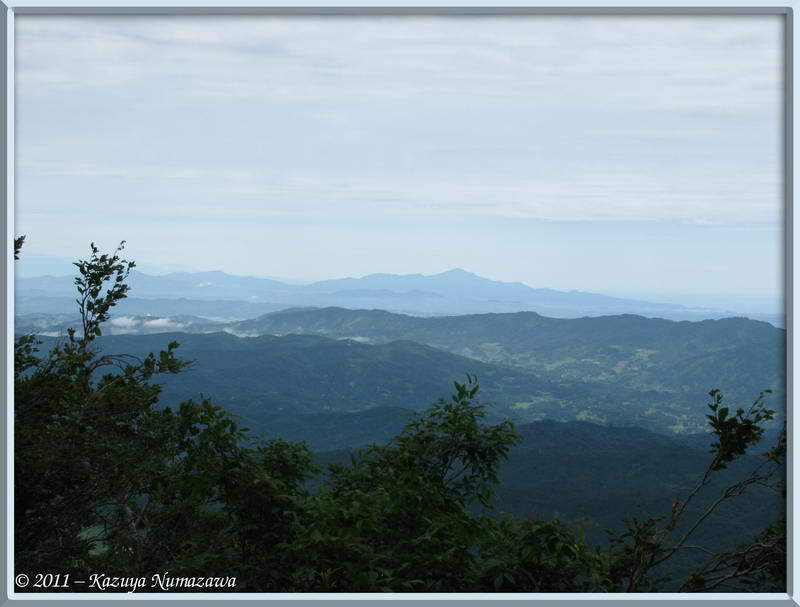 Hakamadake (1,537.2 m = 5,043 ft) area of Mt. 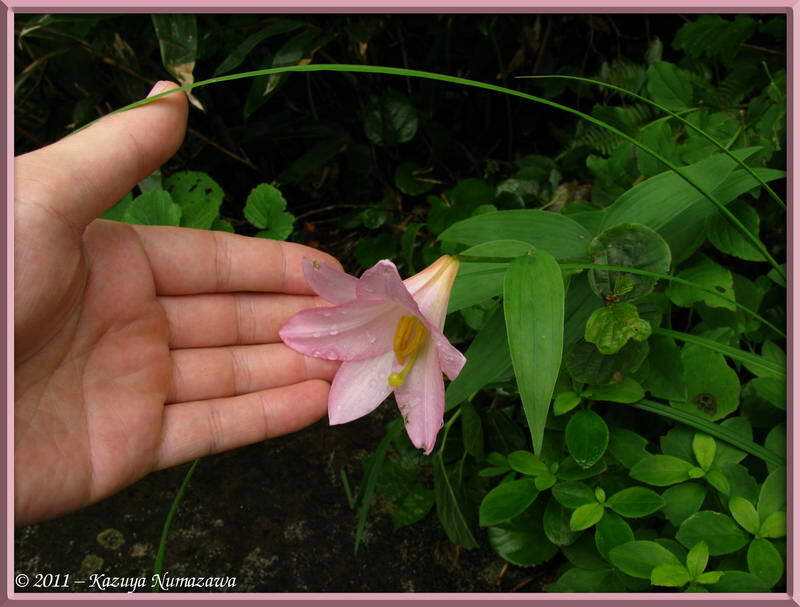 Sumondake. 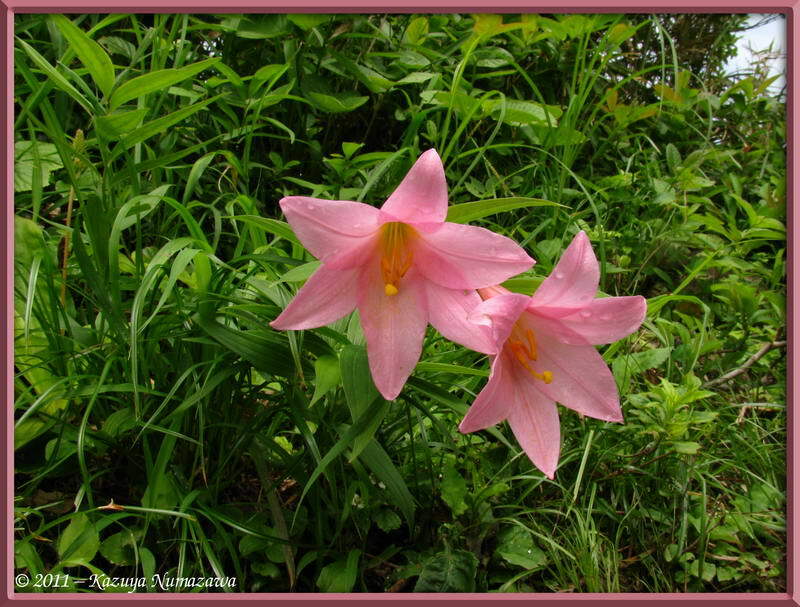 Here is a beautiful close shot of Lilium rubellum and then 2 shots which kind of show you how abundant it was in this area after we passed Mt. 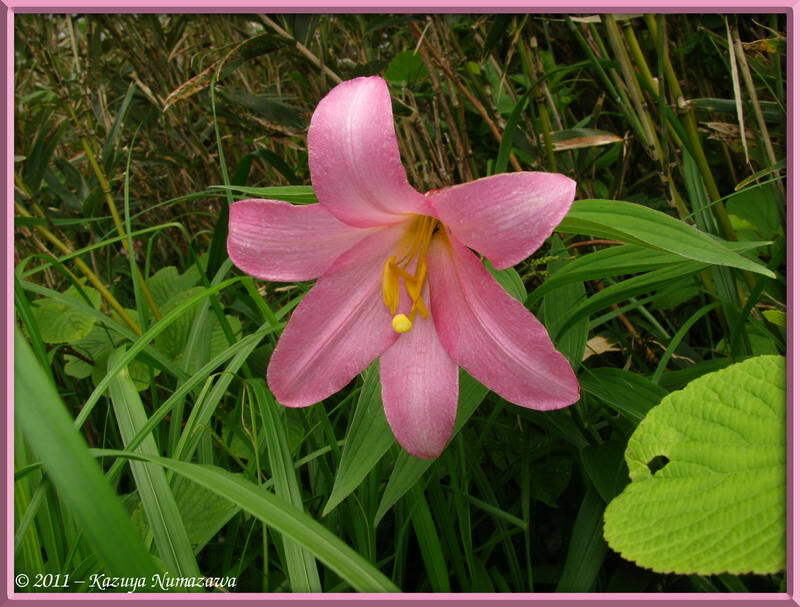 Ohtake. 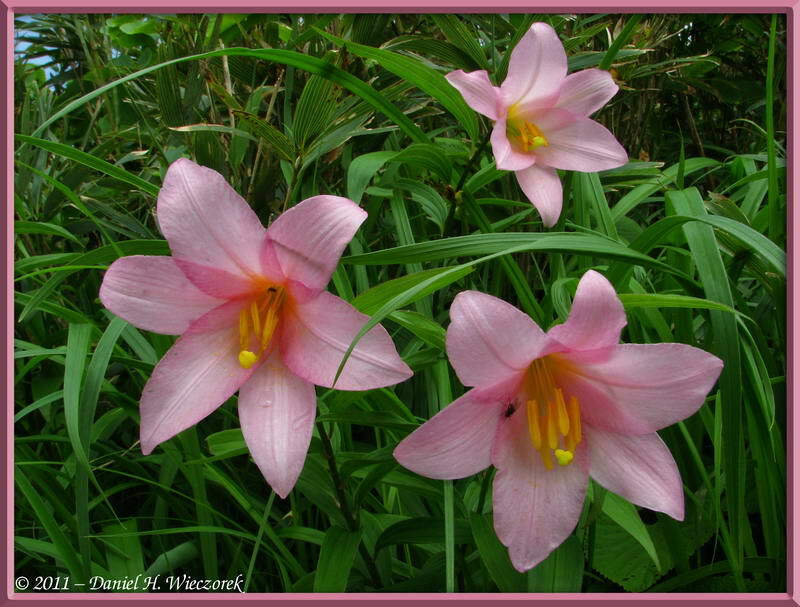 And here are 3 absolutely amazing shots of this flower. 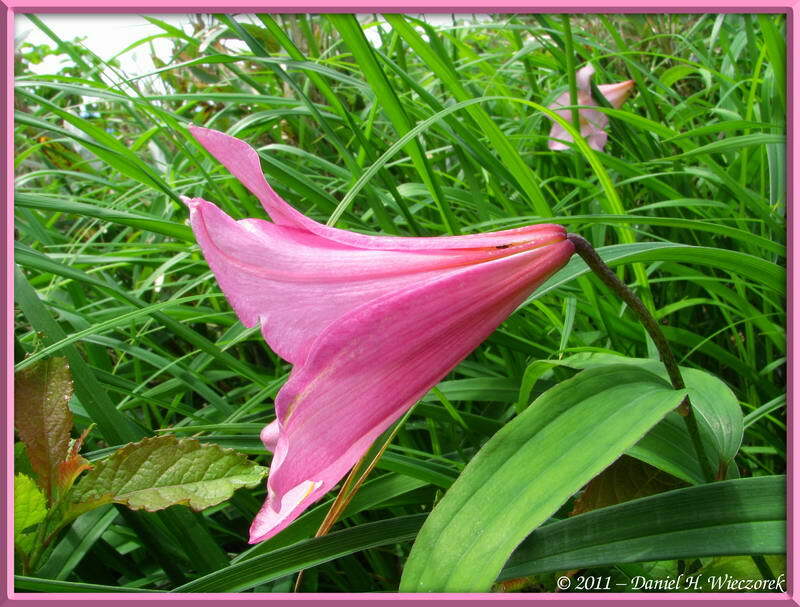 Three more shots of Lilium rubellum. 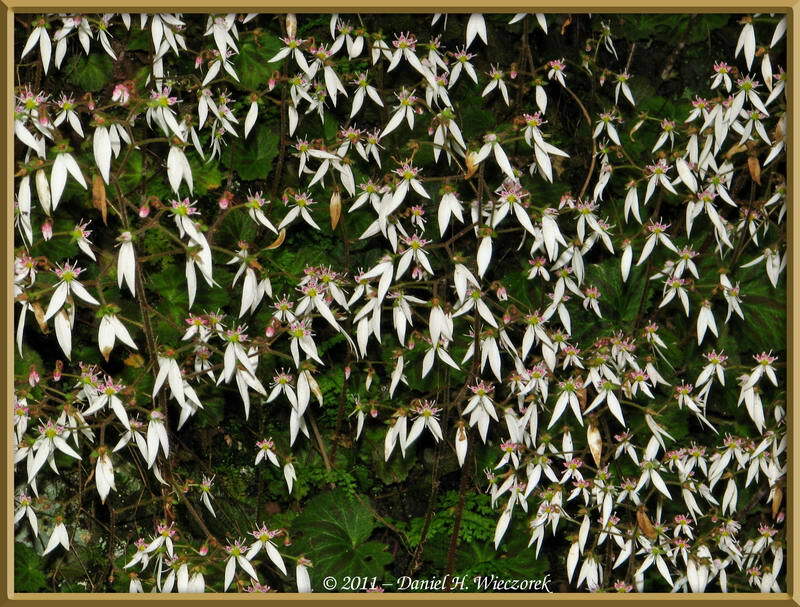 The first shot in this row gives you an idea of the abundance of this plant. The 2nd shot is a 3 shot panorama of the Mt. 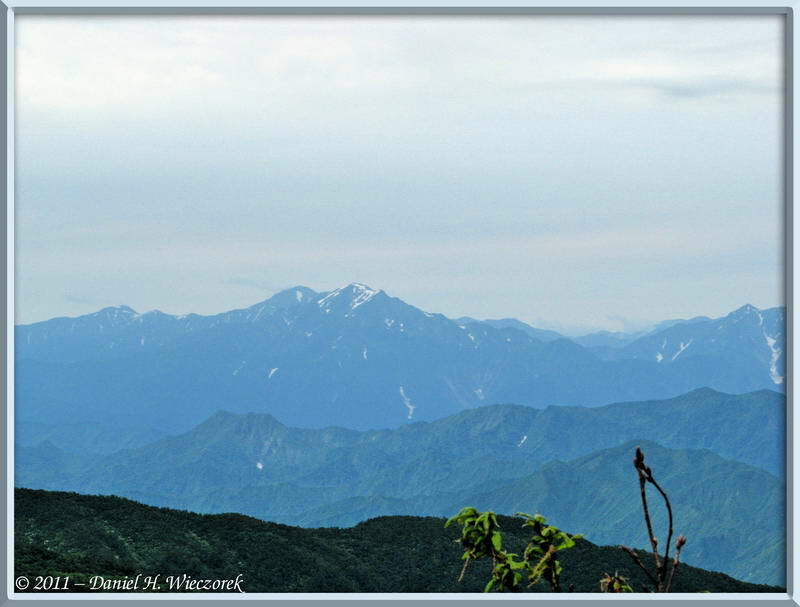 Aokumodake (1,487 m = 4,879 ft) and Mt. 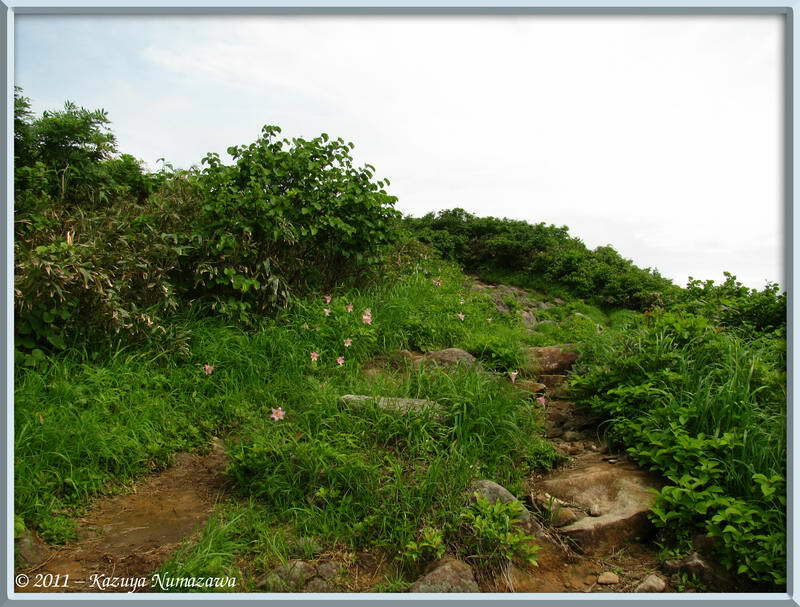 Hakamadake (1,537.2 m = 5,043 ft) area of Mt. 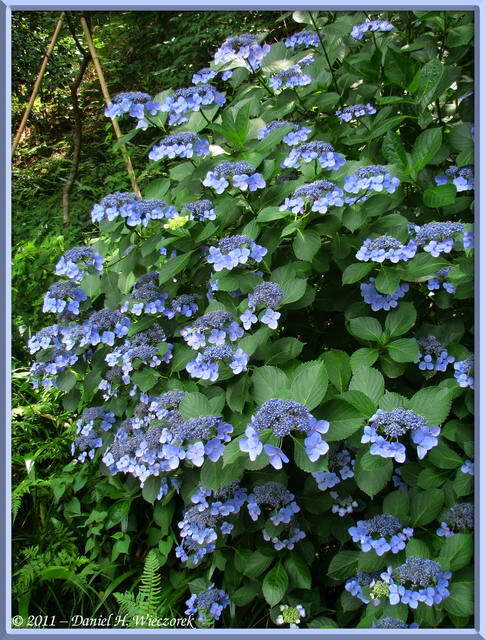 Sumondake. This image has been Tone-mapped. 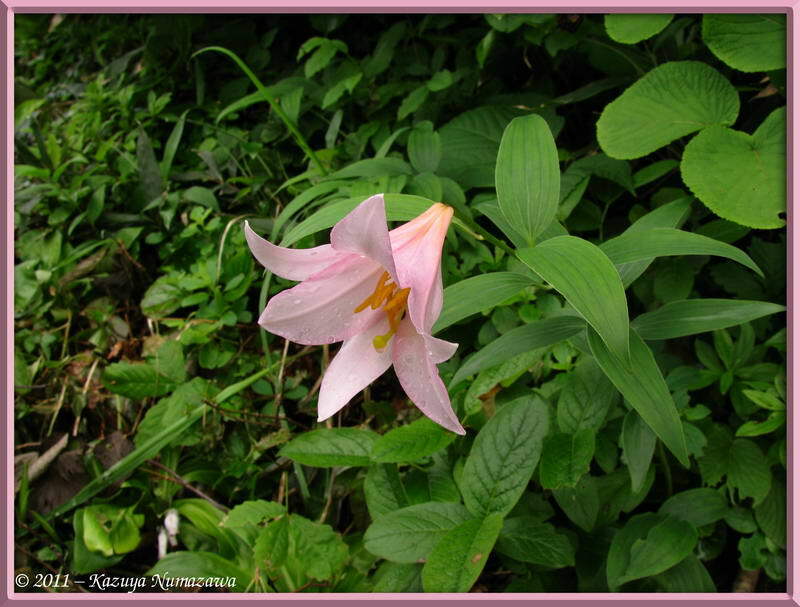 The 3rd shot is a side on view of Lilium rubellum. 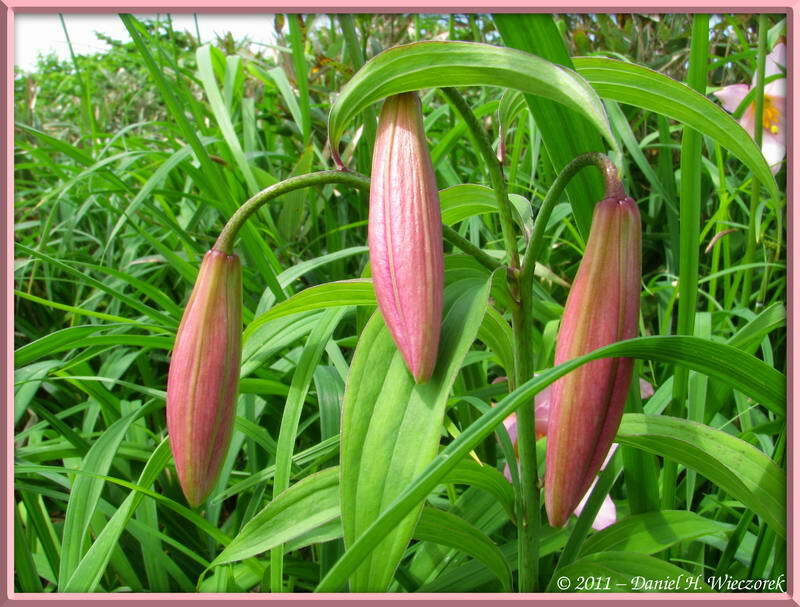 Here is a shot showing 3 buds of Lilium rubellum, then an overview of a small area. 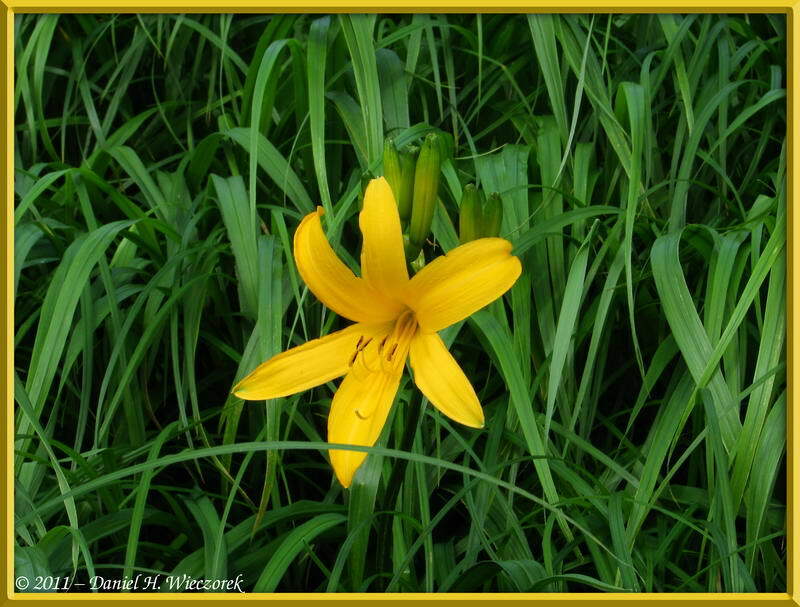 The 3rd shot is a kind of Day Lily - Hemerocallis dumortieri var. 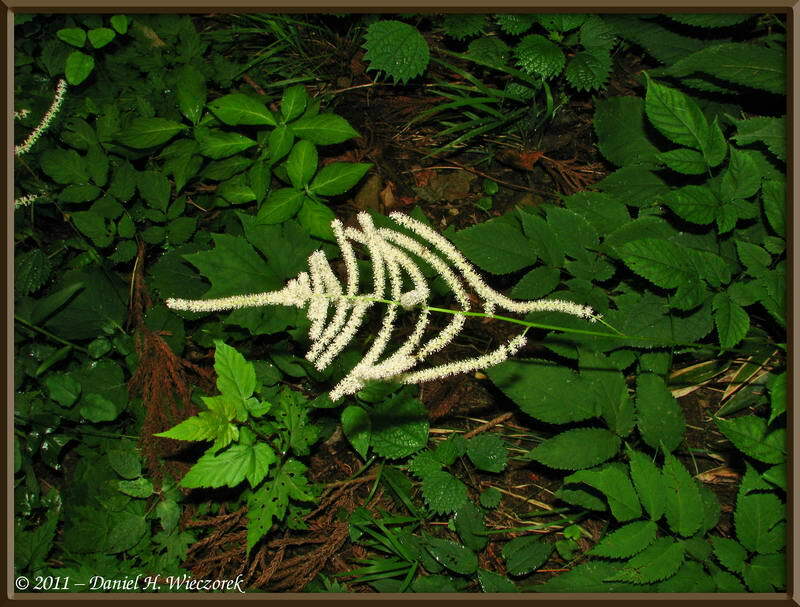 esculenta. 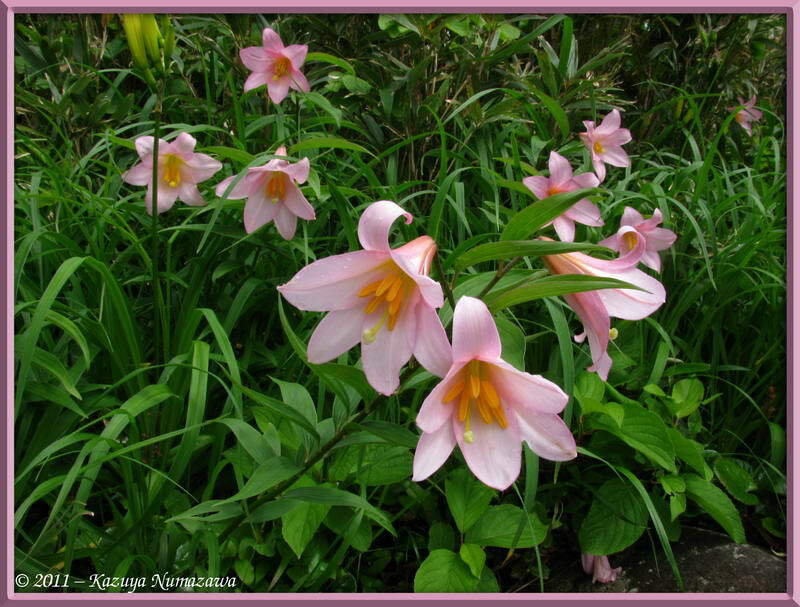 Here is the final row of this page and therefore the final 3 shots of Lilium rubellum. 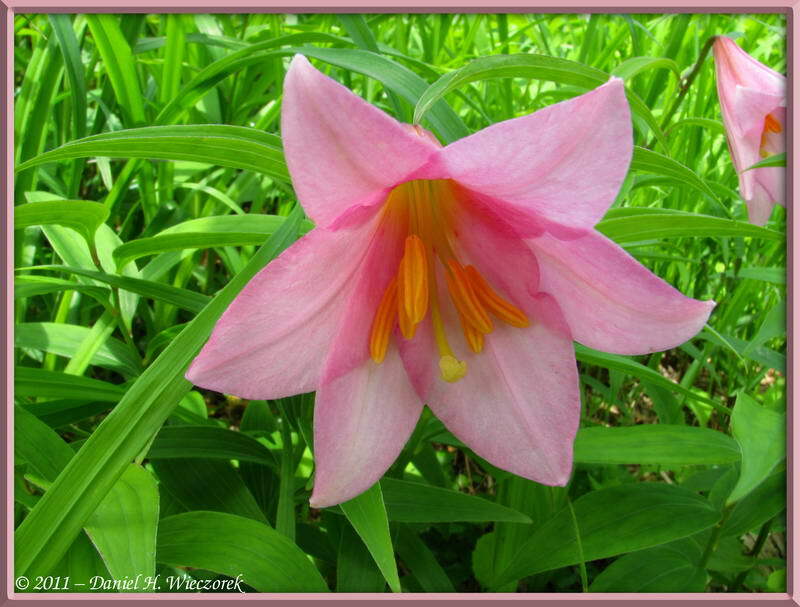 Do not fear - there are only 2 more shots of this flower on the following page. Why didn't I just include one more row on this page?! The final shot on this page was taken at 10:05 AM. The first shot on the following page will start at 10:11 AM.